Ever wanted to know how cloth is made? Our ancestors usually made their cloth themselves from the plants and animals in their surroundings, but today we usually don’t know where our cloth comes from, what it’s made of, or who made it. 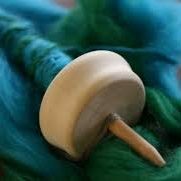 In this class, we’ll cover the first steps of making cloth: spinning on a drop spindle with the basics of the ‘park and draft’ technique; plying; understanding the key role of fiber preparation in the final outcome, and sampling a couple of different fibres, including wool from sheep, angora from rabbits, and flax from linen. Rebecca Graham is an environmental artist and weaver who specializes in creating exciting connections between ancient skills and contemporary knowledge and issues. She is the artistic director of EartHand Gleaners Society. With a background in agriculture and environmental ethics and a BFA from the Nova Scotia College of Art and Design, her workshops reconnect people of all ages and abilities to the land in ways that aim to honour cultures, ancestors, First Nations, and the land itself.